“Before Yocheved joined Meshi, she was 100% dependent upon us. I was her chair, her table and her stander,” Yocheved's mother, Tehiya said. “Somehow we’d fallen between all the bureaucratic cracks, and we had no equipment at home whatsoever to support her limp body. From the start, Meshi lent us everything—a chair with special supports where she could sit and eat, a stander so Yocheved could play, special shoes, the TheraSuit, a communications board, and more. Most importantly, they provided support and guidance in every way imaginable. A smart and communicative 4 year old, Yocheved thrives on the company of her classmates and loves being in their presence. However, the spastic athetoid cerebral palsy that struck her brain at birth has severely affected her body’s muscles, leaving her unable to sit, stand, walk independently, use her spastic hands, feed herself, or a host of many other basic functions. At first Yocheved was taught at Meshi to communicate using her own personalized “communications board” containing pictures of the toys and games she could choose to play with. Although shecould not use her finger or even hand to point, she would shake her head to indicate her choice. Unable to hold the doll she chose, she would play “Mommy” by laboriously, painstakingly willing her spastic hands to grasp and squeeze chunks of clay to “feed” her baby. Yocheved quickly learnt to express herself through the computer – starting with her basic needs, she then learned how to express her feelings, and eventually retelling of her experiences. She has even begun constructing complex sentences. 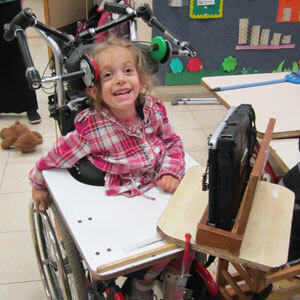 Yocheved's therapists took her one step further by installing 2 switches on her wheelchair – one under her chin as "enter" and the other on the ride side of her head acting as joystick. Aided by these switches, Yochevedis now computer literate andcan use her computer independently. With the beginning of this school year, Yocheved's therapists brainstormed - they recorded Yocheved's favorite storybook on her computer. Using the switches close to her head, Yocheved was able to "read" herself the story, "turning over" the pages one at a time. Her joy and self-pride were incredible to witness as she would "read" the story to her classmates during free time at Meshi. With her peers surrounding her waiting to hear the next sentence, Yocheved's sense of being in control is the greatest gift she could have received! After realizing the huge success, Batsheva – Yocheved's personal communicative assistant has continued to record additional stories according to Yocheved's choice. As of today, Yocheved has 5 stories on her computer which she reads to her siblings while at home. Her parents relate how this amazing achievement provides Yocheved and her siblings with a pastime and has resulted in a happier and more content child.